Wilhelmina and Thomasina end up in quite a mystery when they decided to answer the question, Who the Heck is Harvey Stingle? Seventh grade is about to begin so the girls have a lot on their minds. After all, having a crush on the class hunk is a full time occupation, especially when his ex-girlfriend is the jealous type. Fortunately, Tommy has Willy’s back so the problems don’t get too out of hand for the new girl in school. 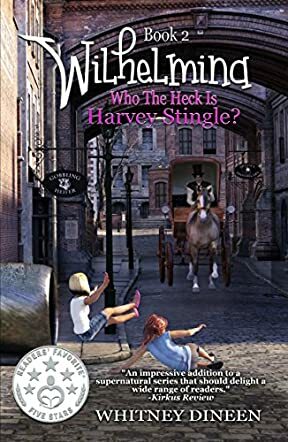 As Book 2 in the Wilhelmina Series by Whitney Dineen, Who the Heck is Harvey Stingle? picks up at the wig factory that has been in Willy’s family for generations, with Willy and Tommy helping out in the coffee bar after school and on weekends. With help from Harvey, they begin to learn more about the town’s past and once again meet up with the three ghosts who belong to the factory. Their trips to the past help them solve a mystery and connect to the life of the town in an amazing way. Will the surprise that has been hidden for over one hundred years help the girls, or will the curse that seems to go with it mean trouble? Who the Heck is Harvey Stingle? is the perfect mystery for middle school readers! Book 2 in the Wilhelmina Series by Whitney Dineen is well written and the action keeps moving. The main characters are everyday girls who also have the special ability of being able to see and talk to ghosts. This creates the perfect combination for a terrific reading experience.